The author would scarcely have penned this little specimen of what Scott called “antiquarian old womanries,” but for the interest which he takes in the universally diffused archaic patterns on rocks and stones, which offer a singular proof of the identity of the working of the human mind. 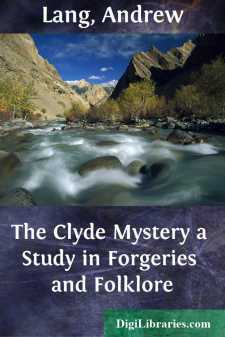 Anthropology and folklore are the natural companions and aids of prehistoric and proto-historic archaeology, and suggest remarks which may not be valueless, whatever view we may take of the disputed objects from the Clyde sites. While only an open verdict on these objects is at present within the competence of science, the author, speaking for himself, must record his private opinion that, as a rule, they are ancient though anomalous. He cannot pretend to certainty as to whether the upper parts of the marine structures were throughout built of stone, as in Dr. Munro’s theory, which is used as the fundamental assumption in this book; or whether they were of wood, as in the hypothesis of Mr. Donnelly, illustrated by him in the Glasgow Evening Times (Sept. 11, 1905). The point seems unessential. The author learns from Mr. Donnelly that experiments in shaping piles with an ancient stone axe have been made by Mr. Joseph Downes, of Irvine, as by Monsieur Hippolyte Müller in France, with similar results, a fact which should have been mentioned in the book. It appears too, that a fragment of fallow deer horn at Dumbuck, mentioned by Dr. Munro, turned out to be “a decayed humerus of the Bos Longifrons,” and therefore no evidence as to date, as post-Roman. If in any respect I have misconceived the facts and arguments, I trust that the fault will be ascribed to nothing worse than human fallibility. I have to thank Mr. Donnelly for permission to photograph some objects from Dumbuck and for much information. To Dr. Munro, apart from his most valuable books of crannog lore, I owe his kind attention to my private inquiries, and hope that I successfully represent his position and arguments. It is quite undeniable that the disputed objects are most anomalous as far as our present knowledge goes, and I do not think that science can give more than all I plead for, an open verdict. Dr. Ricardo Severe generously permitted me to reproduce a few (by no means the most singular) of his designs and photographs of the disputed Portuguese objects. A serious illness has prevented him from making a visit recently to the scene of the discoveries (see his paper in Portugalia, vol. ii., part 1). I trust that Dr. de Vasconcellos, from whom I have not yet heard, will pardon the reproduction of three or four figures from his Religiões, an important work on prehistoric Portugal. To Dr. Joseph Anderson, of the National Museum, I owe much gratitude for information, and for his great kindness in superintending the photographing of some objects now in that Museum. Dr. David Murray obliged me by much information as to the early navigation of the Clyde, and the alterations made in the bed of the river. To Mr. David Boyle, Ontario, I owe the knowledge of Red Indian magic stones parallel to the perforated and inscribed stone from Tappock. As I have quoted from Dr. Munro the humorous tale of the palaeolithic designs which deceived M. Lartet and Mr. Christie, I ought to observe that, in L’Anthropologie, August, 1905, a reviewer of Dr. Munro’s book, Prof. Boule, expresses some doubt as to the authenticity of the historiette.